The number of foreign tourists to South Korea sank 11.2 percent last month from a year earlier, led by a sharp drop in Chinese visitors after Beijing's banned the sale of tour packages to the country, the state tourism agency said Monday. 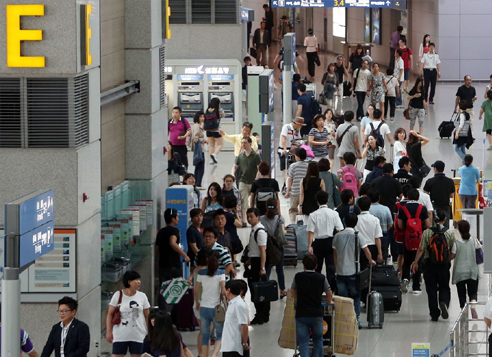 Inbound tourists numbered 1.23 million last month, compared to 1.38 million tallied the previous year, according to the Korea Tourism Organization. The tally of Chinese visitors plunged 40 percent on-year to 360,782 from 601.671, followed by a 24-percent on-year fall from Hong Kong and a 14.8-percent decline from India, the KTO said. As widely expected, the Chinese vacuum dragged down the overall tourist tally for the cited month, which came as Beijing imposed a ban on the sale of tours to South Korea starting March 15 in apparent retaliation for Seoul's planned installation of the US Terminal High Altitude Area Defense. The cumulative tourist tally of Asia's fourth-largest economy stood at 3.7 million in the first three months of this year, up 3.2 percent from the same time in 2016. However, the on-year figure for Chinese tourists shrank 9.2 percent to 1.51 million in that period. The gain from Japan and Southeast Asian countries helped cushion the Chinese decline, which posted moderate double-digit growth on average from a year ago, except for a slight fall from the Philippines, the agency said. Tourists from Taiwan also soared nearly 30 percent in March from the previous year on the back of a government and industry-led drive for incentive tours and promotional campaigns, it added.